When Intel's first Core i7 architecture touched down last year there was a great amount of excitement surrounding the X58 chipset. It was fast, efficient and, with the new Core i7 chips, it was the platform everyone wanted. Unfortunately, thanks to all the server-style loveliness the setup encompassed, it also came at a very high price. Many people decided then that the slightly cut down micro-ATX boards, which came later, represented a sacrifice worth making for the savings. History looks set to repeat itself here with these smaller but still feature-packed P55 revisions, and MSI is one of the first to the P55 party with the P55M-GD45 socket 1156 motherboard. We've been waiting to see P55 motherboards dropping below the £100 mark and, with the micro-ATX boards now hitting the shelves, we've finally got our wish. Coupled with a Core i5 CPU you can set yourself up with a mobo, chip and memory for £300; a bundle that will keep you sweet for a while to come. So what are the sacrifices when dropping down to the smaller board? Well, not as much as you might think. Sure, the board layout is more cramped and you don't get as many SATA ports as the larger, pricier boards, but in performance terms it's still in with a shout. At stock frequencies the £200 Gigabyte UD6 only manages to shave a couple of seconds off its Cinebench time and can only add another 10fps onto the WiC score. 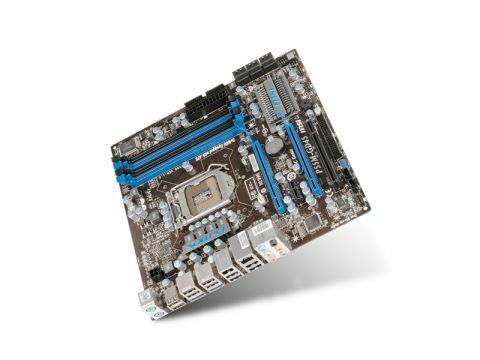 With your standard components running out of the box then you're not really losing out too much by dropping in the m-ATX board. Where you are losing out is in the overclocking stakes. That's almost a given though with this cheaper board using cheaper components and fewer phases in the power circuitry offering lower overheads. That said we still managed to get some decent scores out of it. The OC Genie feature claims to offer the best overclocking settings for your system simply by enabling it in the BIOS. While it actually gave us a fairly poor overclock (only 3.05GHz), it did give us a heads-up on the voltage settings we could use. With only a little extra tweaking to the OC Genie's setup, we hit a pretty chunky 3.6GHz core clockspeed, with the processor Turbo-ing to 3.8GHz and 4.3GHz in multi- and single threaded apps respectively. However, the more expensive Gigabyte board was able to far exceed that speed without voltage tweakery, and that inevitably is why you pay the extra money. But, on a board that's less than half the price, you really can't sniff at its performance. Unless of course you are planning on clocking the nuts off your rig. The sacrifice of dropping an m-ATX board into a standard size case isn't going to limit you much with this latest breed of tech.